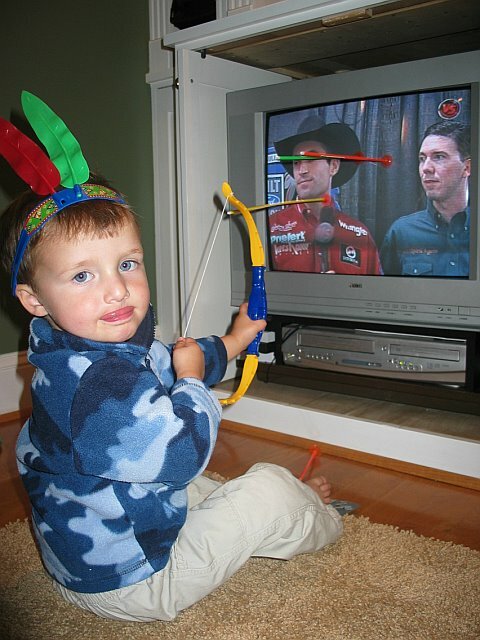 “Watcha doing Peter?” So we put on a rodeo and he sees cowboys…poor TV and poor cowboys. Oh, and the post I wrote before this is pretty funny. I must have posted it at the wrong time as the reads were low. It is really a funny story about the older boys and going to the eye doctor a few years back. “You’re not taking out my eyeballs!” Anyway, scroll down if you need a good laugh. Have a good day! A modern take on “cowboys and indians”? That is what I thought too! Ha ha! Did you see his tongue sticking out because he was concentrating? I snuck up and said his name and snapped it when he looked. So funny! My kids are big TV watchers so I’m not surprised he figured out how to television watching participatory. Ha ha! Hahaha, love it! I notice Peter has the best seat in the house, and makes sure his aim strikes true! LOL. That is the little tv and the only one the kids can turn on. I unplugged it about six months ago because I couldn’t take Sponge Bobs voice anymore and it’s stayed off this whole time. They really only watch tv when we do movie night or at night with us before bed. I thought it was so funny!